Most Copenhageners know Vestergade as a cosy street in the city centre stretching from Vester Voldgade by the City Hall down to Gammel Torv by Nørregade. It exudes life and people visiting cafes, shops and moving through the street on foot, riding bikes and in cars. At night it changes its hue becoming more colourful and festive since many young people use the street’s varied assortment of bars. A challenge in this neighbourhood has been people in cars with no actual business in the street itself, particularly at night. This unwelcome traffic has been bothering the neighbours and made the users of the street feel unsafe. Also, cyclists were only allowed to go one way, from Nørregade towards Vester Voldgade, which created a hindrance for some cyclists on their way through town, while others just ignored the rules and cycled there anyway. 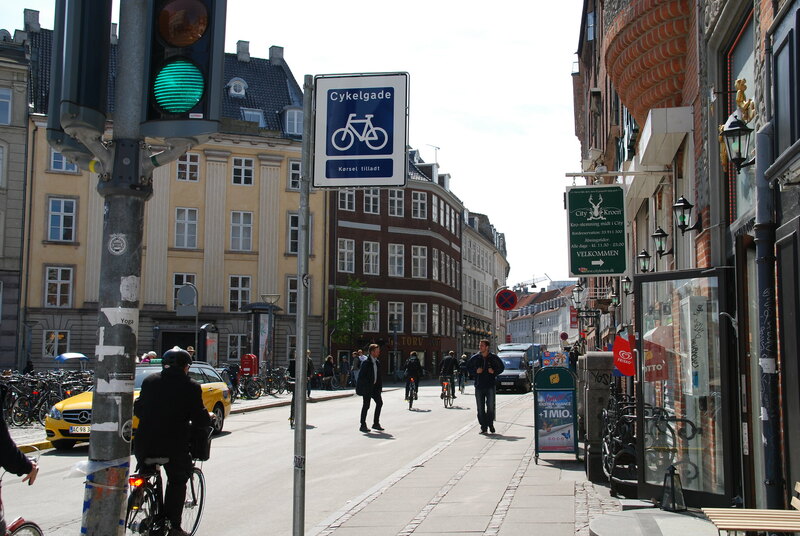 Thus, Copenhagen Municipality decided, that Vestergade needed to be protected and have its traffic rules changed. Vestergade’s traffic and city life called for a solution so in November 2013 Vestergade was experimentally assigned as a so-called bicycle street: a street where the traffic runs on cyclists’ terms and where drivers must show extra consideration and awareness for the cyclists. The purpose of doing this was to improve the conditions for the many cyclists as well as preventing unnecessary car traffic in the street. Now the street is two-way for cyclists and one-way for cars and therefore the cars must adapt to the cyclists, which naturally leads to a lower speed. Also the direction for cars has been reversed so now they can only go from Vester Voldgade towards Nørregade. The assignment of Vestergade as a bicycle street also means that more bicycle parking has been established on one side of the street as well as the possibility for short-term parking for cars in marked bays. Vestergade is the first bicycle street in Copenhagen, but the concept is known from other cities, for instance in Germany and the Netherlands. Aarhus Municipality lead the way in focusing on bicycle streets in Denmark and as early as 2012 they established the first one in the country. Following that, Næstved Municipality also created their own bicycle street, amongst other things to promote cycling in the city. Therefore it is a natural step for Copenhagen, which is working hard to become the best bicycle city in the world, to become inspired by these initiatives. The bicycle street in Vestergade is therefore an excellent start and will hopefully lead to more of its kind. Improved bicycle conditions in Vestergade has led to a better connection with the rest of the network of bicycle routes in the city and has thereby also created more direct routes for cyclists. The establishment of a bicycle street in Vestergade has meant that the number of cyclists riding there on a work day has risen from 4,600 to 7,600. There has also been a decline in the car traffic from 2,400 cars on a work day in 2013 to around 900 in 2014. Copenhagen Municipality is focusing on improvements for more efficient bicycle routes around the city so even more people will choose the bike as their transport of choice. An important element in the Copenhagen bike strategy is to make Copenhagen a good city to live in. One of the goals is to create a coherent bicycle network with attractive bicycle routes and streets making Copenhagen an even better city to live and cycle in.